There are a lot of smoky, peaty whiskys out there. Five of the most distinct peaty Scotch whiskys are featured below. Large parts of Scotland are covered with peat bogs. These peat layers have been formed over a period of 1000 to 5000 years by decayed vegetation and can be up to several meters thick. Each bog grows by approximately 1mm per year. Thus a bog of 3 metres thickness is approximately 3000 years old. 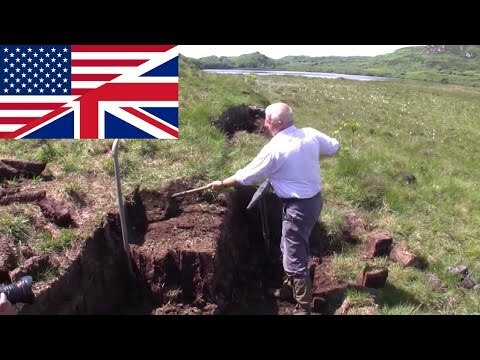 Since the dawn of time people have been using peat as an energy source in Scotland. Peat is cut in small slices and piled up into small pyramids for drying. The water drains off the peat very fast and turns the soft slices into hard briquettes. Similar to coal, these briquettes contain the energy of the dead plants. But what is peat needed for in whisky production, and how does the smoke flavour come into the whisky? The old Scots used peat to heat the pot stills. However, this doesn't lead to the smoky flavour of the whisky. Does the water, which runs through peat moors, influence the smokiness of the whisky? The answer is a clear NO! Peaty water contains only a few ppm (parts per million) of peat particles, which colour the water brown but don't contribute to the smoke flavour. Sure, the water is crucial for the quality of the whisky, but it doesn't influence the smokiness. Only drying the damp malt over a peat-heated fire brings the smoke into the barley grain. If you want to know more about malting we have a comprehensive article for you. The level of smokiness of a whisky is determined by the time the barley grain is exposed to the pungent peat smoke during drying. Damp malt is usually dried for approximately 30 hours. Laphroaig dries its malt over peat fire for about 18 of these 30 hours, while Glengoyne uses only unpeated fire. Thus you get a broad variety ranging from extremely smoky whisky to almost completely smokeless whisky. Malt grains are peculiar in that they lend a hint of smokiness to the whisky even without a peat fire. The mass production of scotch during the last 200 years has boosted the demand for peated whisky. Especially the distilleries on Islay produce heavily peated whisky, above all Laphroaig, Lagavulin, Caol Ila, Ardbeg and Bowmore. The smoke flavour of these whiskies is so strong that they bring a significantly smoky note to blended scotch, even when diluted with water and grain whiskies at a ratio of 1:20. Modern harvesting methods allow for a large-scale extraction of peat, as can be seen in the following pictures. Peat digging resembles agricultural harvesting rather than brown coal mining. Just look at the agricultural machines used for harvesting peat. The briquettes (even after 200 years they are still briquettes) are still dried on big stacks so the water can drain off according to the laws of gravity. The whisky industry tries to reduce peat consumption with several methods. Bowmore, for example, grinds the peat into a gritty powder that is put on normal fire and produces the required smoke. This way the smoke yield of the peat is increased. But also the modern industrial maltings, such as Port Ellen, Glen Esk and Glen Ord, use the peat more efficiently than what can be achieved with traditional kiln fires. They use closed systems where the smoke is led over the barley grains several times until it is properly exploited. This way the smoke doesn't escape into the environment through the pagoda roofs after a single contact with the grain. Upon ordering malt, the distilleries state the exact amount of smoke they need for their malt so the whisky has the desired flavour. But there are also critical overtones! The heavy use of peat for malt production has already exhausted some peat deposits significantly. Around Campbeltown no more peat is dug, so it must be brought in from more remote areas like Islay. However, you don't have to worry about the future. Estimates have shown that in Scotland more peat regrows than is harvested by the whisky industry.